Let's Go Atom! The latest Eee PC is equipped with Intel's N2800 CPU which promises to save more energy and makes this model faster than most Atom netbooks to date. Can the 10-inch netbook face off against fierce competition from AMD's Fusion APUs? Find out in the following review. 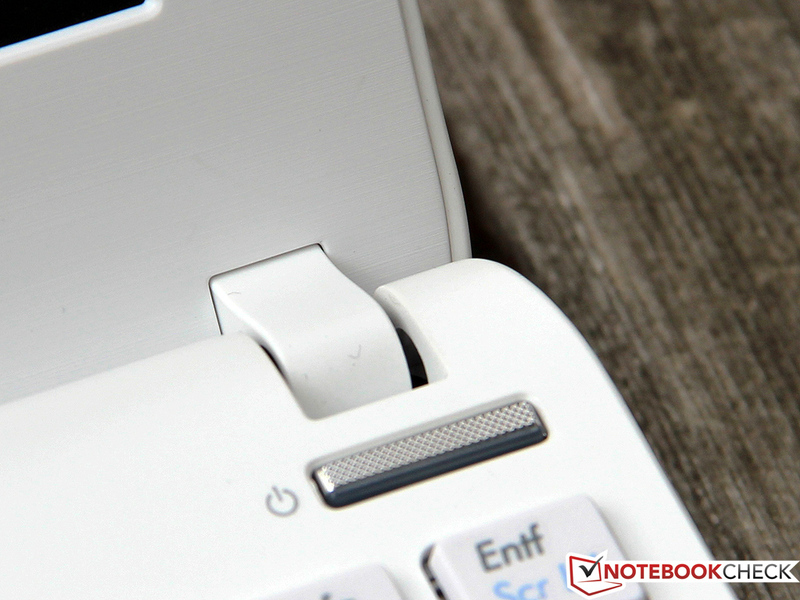 The Netbook boom has quieted down. The sale numbers are dropping and some manufacturers are thinking about pulling out of the market completely. 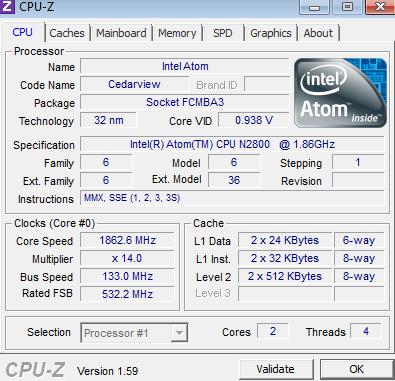 So it is about time for Intel's new Atom platform, the "Cedar Trail", to breathe some life into this category. We previously tested two models with the entry-level N2600 CPU. 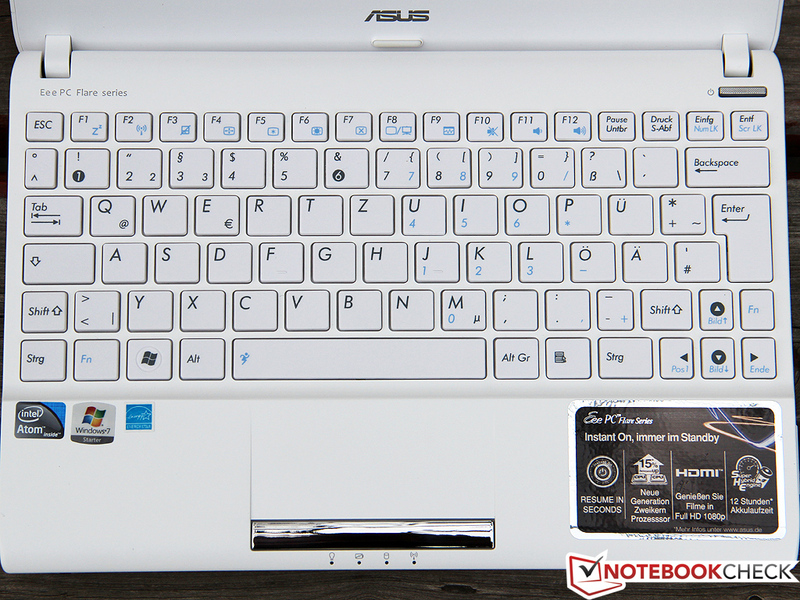 Now we turn our eye to the Asus Eee PC R052C which contains the stronger N2800 processor. This laptop uses 1 GB RAM and has a 320 GB hard disk. All of this is packed into the 10.1 inch chassis with a non-glare display. 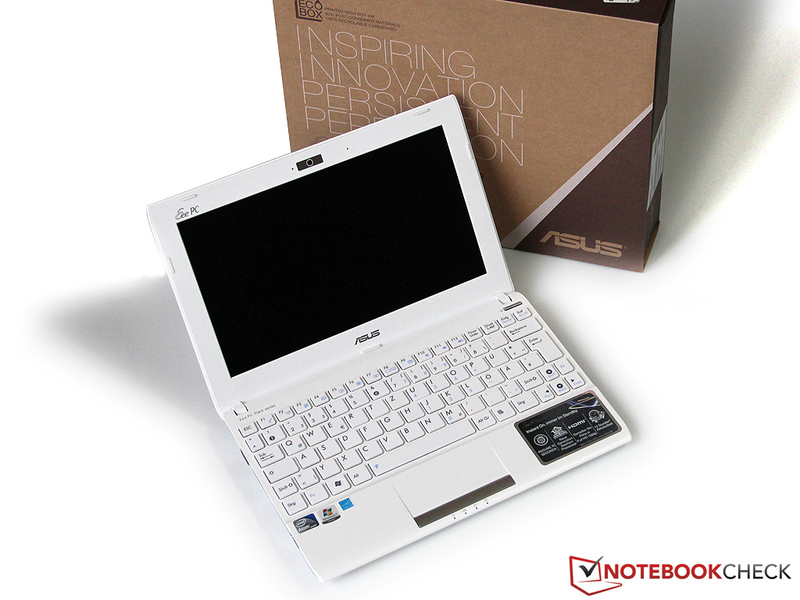 With the operating system (Windows 7 Starter, 32-bit), Asus asks for around 320 Euros (404 USD) for this model. 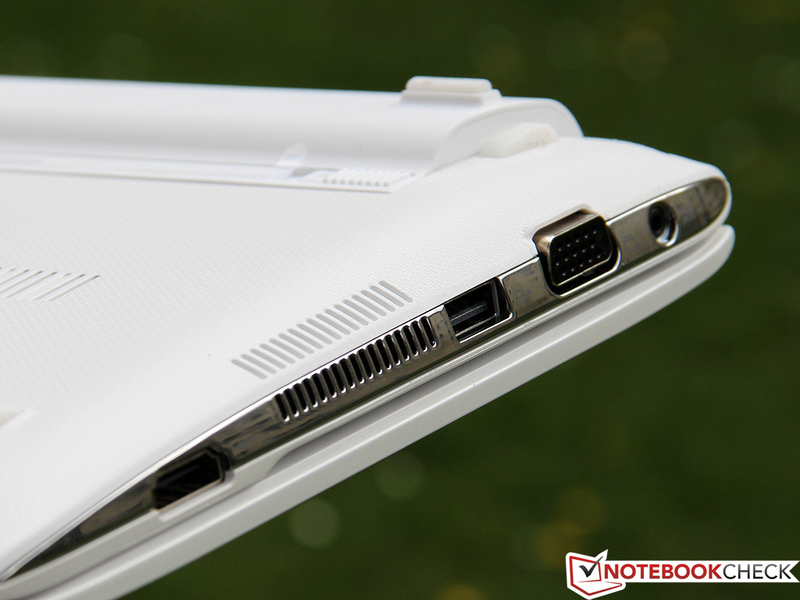 In the following sections, we will take a look at whether the Netbook is worth the money. 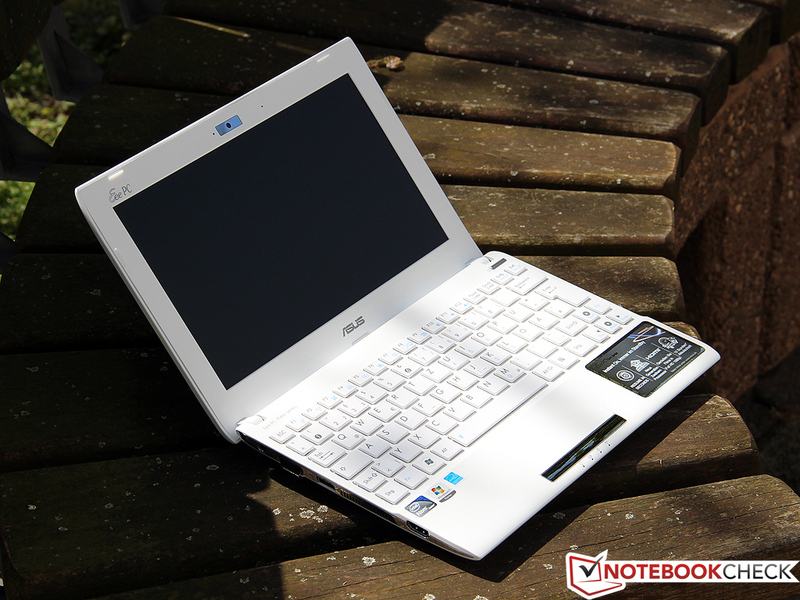 The market is filled with competitors, which include the recently-tested Acer Aspire One D270 (priced well below 300 Euros [379 USD]) and other models which use the new Cedarview Atoms. The Netbooks based on AMD's Ontario series are especially interesting and this includes the Acer Aspire One 722 (now available with a C-60). 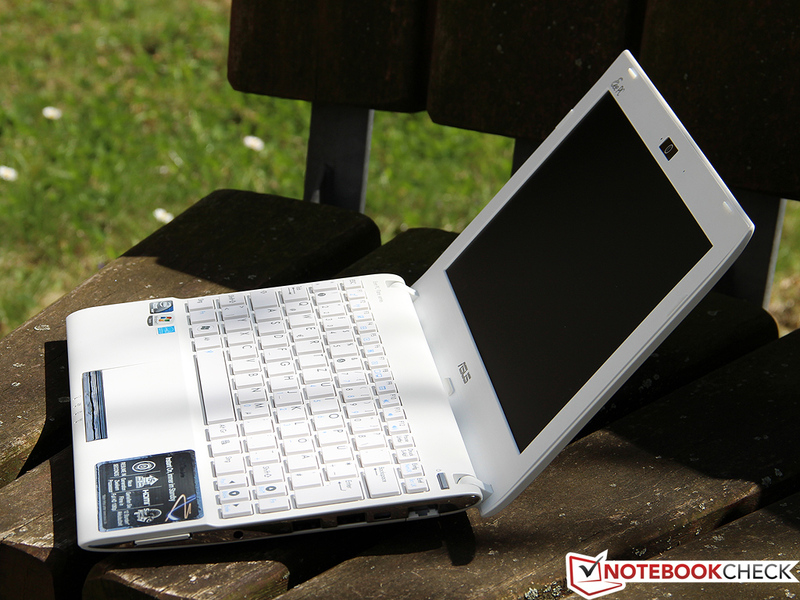 Tip: The Eee PC 1025C is another model, identical to the R052C. The test model weighs 1.25 kgs (2.76 pounds) and is 34 mm (1.34 inches) thick. This is a poor showing for the Eee PC when much larger Ultrabooks have slimmer measurements and lighter weight. However, the test model can still be classified as highly mobile. The case itself is quite slim, but its thickness is increased by the protruding battery, which serves as a stand for the laptop. 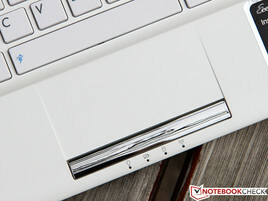 The small performer makes a good visual impression: the matt white synthetic materials prevents fingerprints and makes it easy to clean dust off the Netbook. A few chrome streaks on the side make the design more appealing without coming off as cheap or too shiny. We are bothered by a single flaw: the display border is too thick at 2 cm since this is enough space to install a larger display. The sturdiness is good. The case resists pressure well without making any noises and the Netbook base and cover are quite strong. We especially praise the well-designed hinges, which are comfortably stiff and prevent the display from moving much. With the exception of the overly thick display border, the workmanship is exceptionally good. All edges have been carefully rounded and the material gaps are perfectly measured. 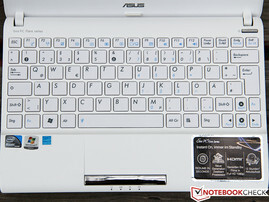 The R052C carries on the standard of good performance set by previous Eee PCs and can compete with the Aspire One D270. 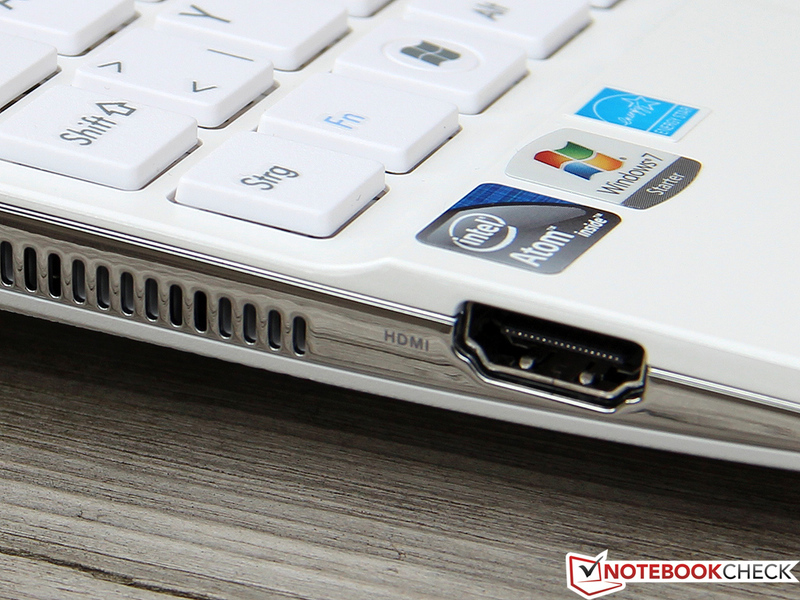 Finally, thanks to the new Cedar Trail platform, Netbooks include a digital HDMI interface as part of the standard connectivity. 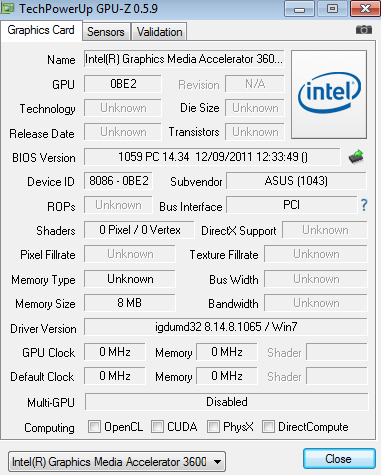 Till now, only the AMD devices had this interface. The older VGA interface is still on-board, but the two interfaces cannot be used simultaneously. Unfortunately, the 3 USB 2.0 ports have not been upgraded. These still deliver average speeds of 30 MB/s. 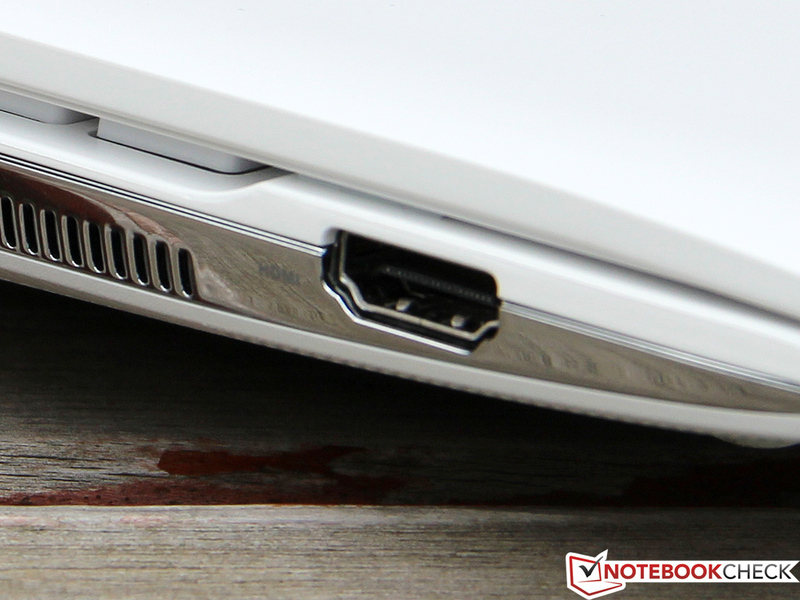 It will take some time till the latest USB 3.0 standard is provided on the majority of Netbooks. 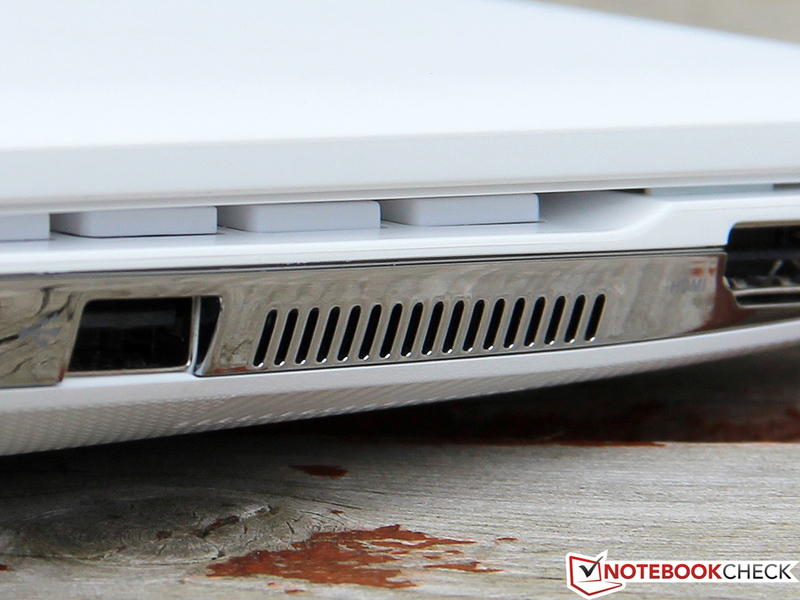 Like the old Fast-Ethernet port, this will not restrict the use of Netbooks as a mobile secondary laptop. The integrated card-reader is of more interest: it supports SD, SDHC and MMC. Asus has made good use of the limited space on the case. Most ports are distributed on the right and left side of the case, with USB ports placed on both sides. 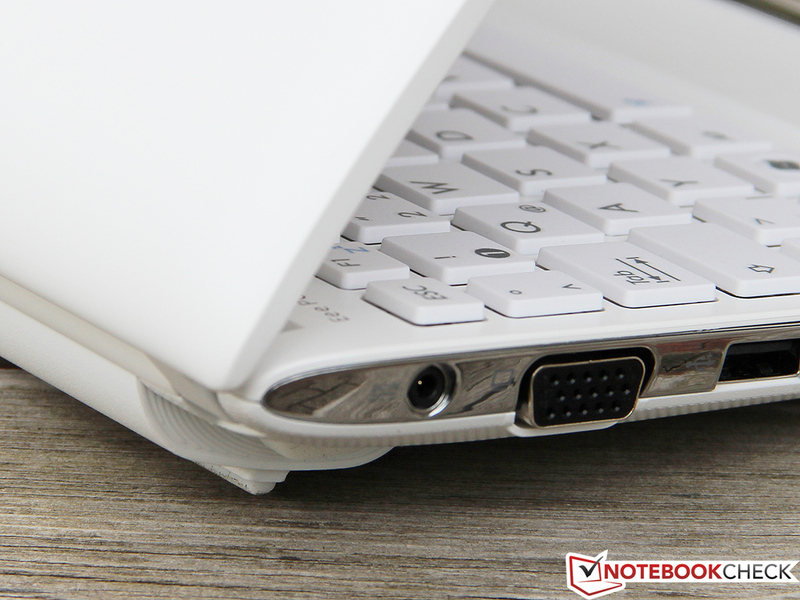 The power-in, LAN and VGA, typically used when the Netbook is stationary, are placed on the back. Large devices can block neighboring ports when connected to the Netbook, but due to the limited space, it is hard to avoid such a dilemma. The Atheros WLAN adapter (AR9285) is an entry-level model which can support a maximum of 150 MB/s (total transfer rate - 1x1 antenna layout). This should suffice for simple surfing but the limited 802.11b/g/n support makes connecting to networks on the 5 GHz frequency impossible. 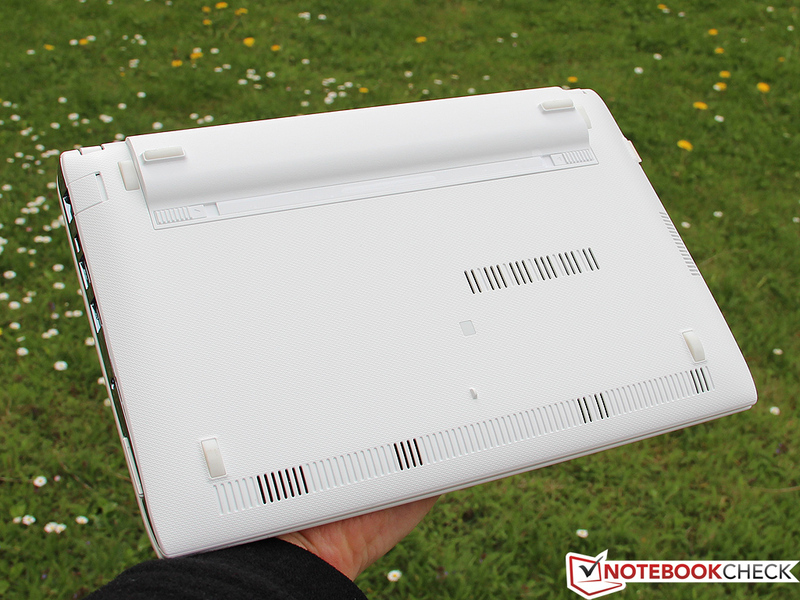 The Netbook had good signal quality and range in our test. Unlike the Acer Aspire One D270, the buyer will not receive an integrated Bluetooth module and a UMTS module is far out of the price class of this test model. Bluetooth and UMTS can be procured with a USB stick. The 0.3 MP webcam integrated in the display border records blurry pictures and videos. Skype chats or quick snapshots should not be a problem with this webcam and the slightly muffled microphone. We do not expect Netbooks to be delivered with a mountain of accessories and the R052C was no exception to the rule. The laptop is delivered with its battery, 30 W power adapter and a few brochures. The compact carton does not contain anything more. Asus has installed a recording program for the webcam and a few more or less sensible tools. Overall, the system is clean and well configured. The Netbook does not have a maintenance flap so opening the case will void the warranty. If this is acceptable to the user, then he/she can remove 5 screws (4 in the battery slot and a central one under a rubber cover) to access the insides of the laptop. 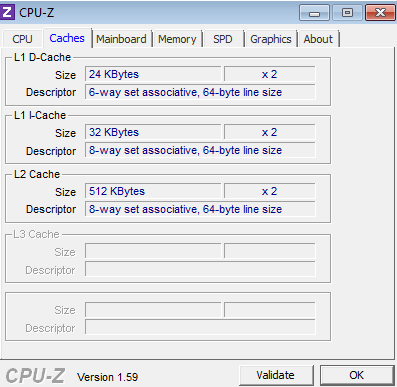 The user can then upgrade the RAM up to 4 GB or swap out the hard disk. Inexperienced users should not undertake this procedure. The synthetic material construction of case seems weak and not especially reliable. 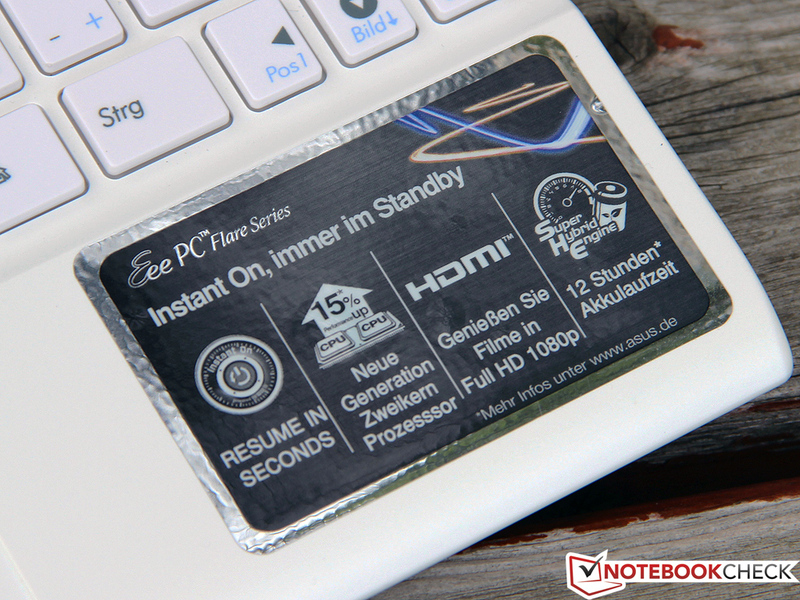 The Eee PC has a 24 month manufacturer guarantee which can be extended to three years for a fair price of 60 Euros (76 USD). The respective Pick-Up & Return service package is offered by many online distributors for Germany and Austria. 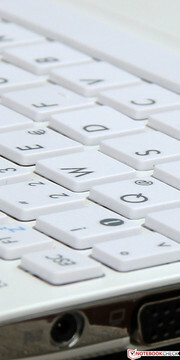 The chiclet keyboard of the R052C is similar to that of the Eee PC series. That is why we will only briefly cover it. 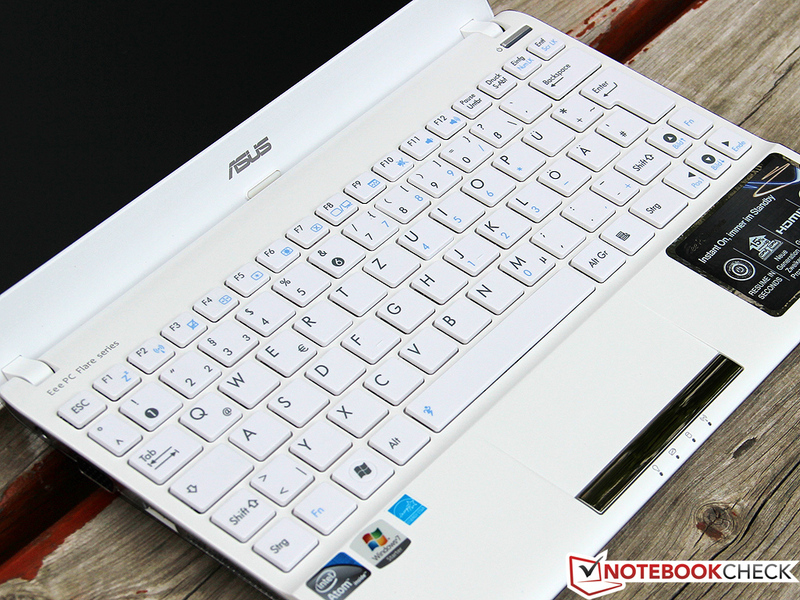 The key size is 14 x 14 mm and is rather small for a Netbook, although Asus has made optimal use of the case width. The pressure point is decent and well-calibrated. We did not like the slightly rickety and poor typing feel. 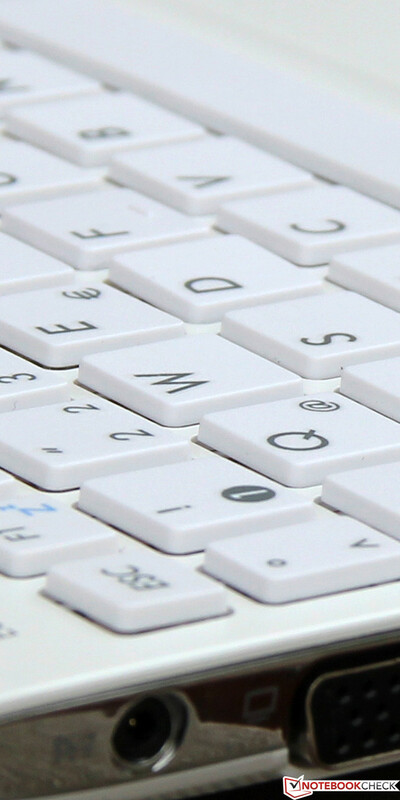 Another flaw would be the space key is non-responsive near the left bottom border. There is room for improvement, but one should keep in mind the low price of the model. 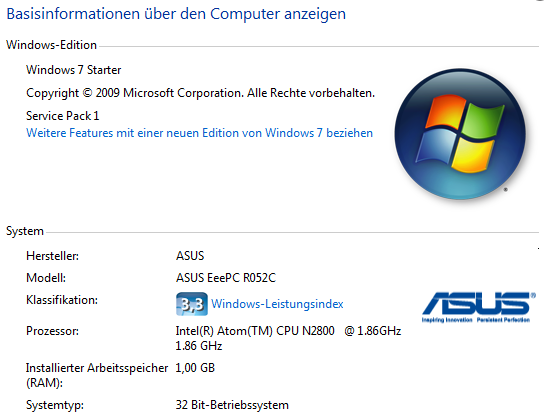 This standard is acceptable for a 300 Euro (379 USD) Netbook. 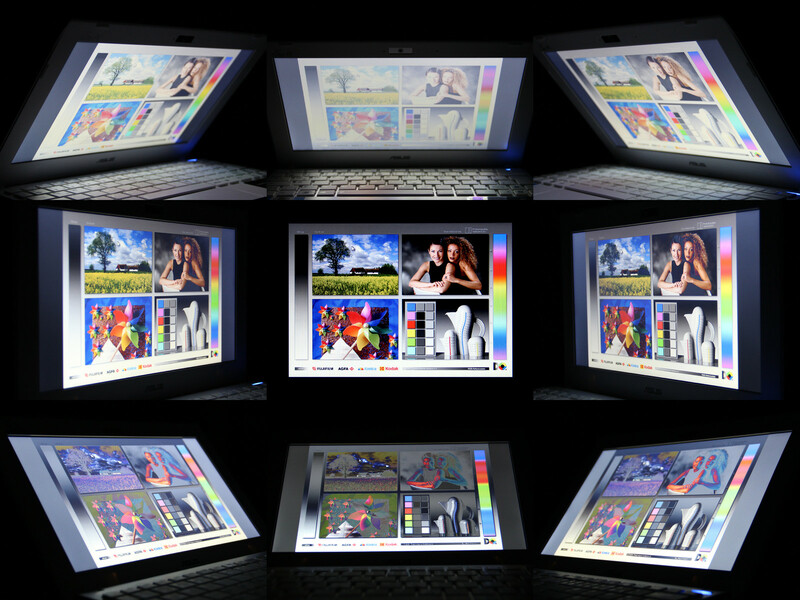 The touchpad, manufactured by Elan, is 9 cm diagonally and supports multi-touch gestures (up to three fingers). The input area is a bit too smooth for our taste and only dry fingers will have proper contact on the surface. The touchpad does not have a border at the top which makes it harder to distinguish from the rest of the case, resulting in the user occasionally leaving the touchpad surface. A wide chrome bar represents the mouse keys, and unfortunately, input is only possible on the right and left edges of the bar. The 10.1 inch display has a resolution of 1024x600 pixels (118 dpi), which places the R052C beneath some high-end Smartphones. Unfortunately this is the standard resolution for Netbooks and exceptions, such as the Acer Aspire One 522 (1280x720 pixels), are few. The low resolution prevents comfortable working with multiple windows. Still, the matt display has a balanced distribution of brightness and is bright enough for most scenarios at 227 cd/m². While running on battery, the brightness is not restricted. In comparison to its many competitors, the test model lies in the mid-field. Thanks to the great black value, other Eee PCs, like the 1011CX or 1015B, had great contrast ratios of above 800:1. 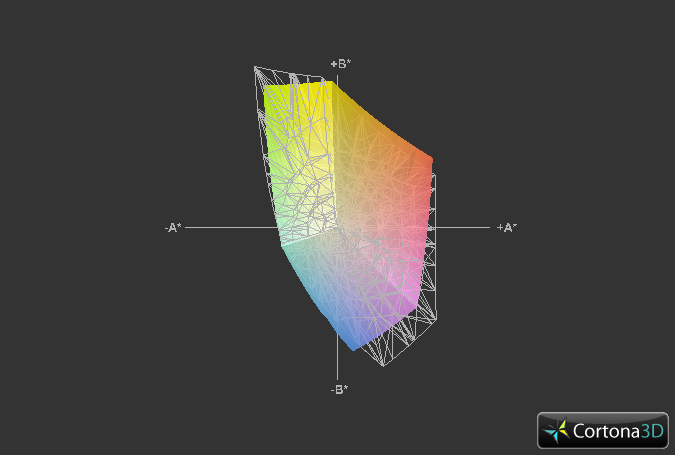 The R052C lags behind and reaches a mere 156:1, which indicates that dark areas of the screen may seem slightly gray due to the black value of 1.52 cd/m². The low-quality TN panel is at fault (Infovision M101NWT2), as is the case in many other models from other manufacturers. The displayed colors are dull and we would not describe the display as very good. Our measurements confirm our suspicion: the display covers a mere 40% of the AdobeRGB color room. 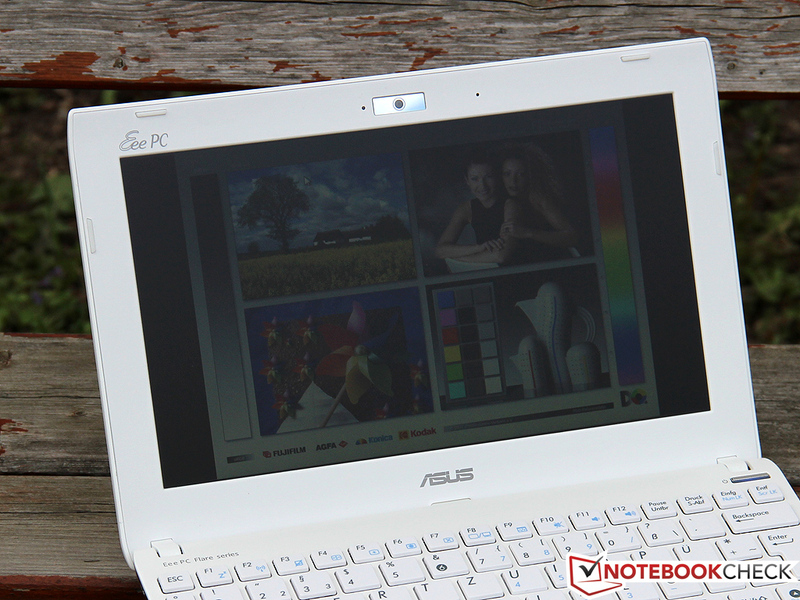 One of the most important features of a Netbook is its outdoor compatibility. Thanks to the matte display surface the content remains legible even outdoors, although we would have liked to have slightly more brightness. The 1015B is ideal for outdoor use as it is almost 300 cd/m² bright and is suited for even the brightest surroundings. The R052C is not quite as good and in a few cases, the user will have to find a darker spot to be able to read the display comfortably. A 10-inch laptop will rarely be viewed by multiple people simultaneously. Our test model is not suited for this scenario. 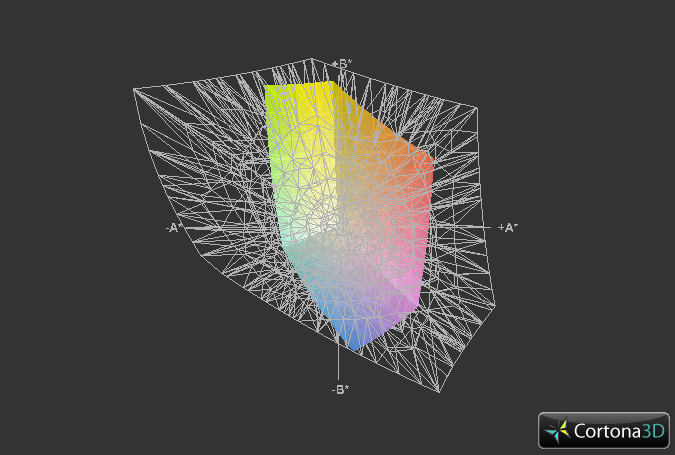 Horizontally and vertically, the brightness and contrast drop at even the smallest deviations. Dark regions are especially problematic and hard to recognize. Tablets available for the same price use IPS panels as these have great viewing angles. Why manufacturers do not use these for Netbooks is probably only known to them. 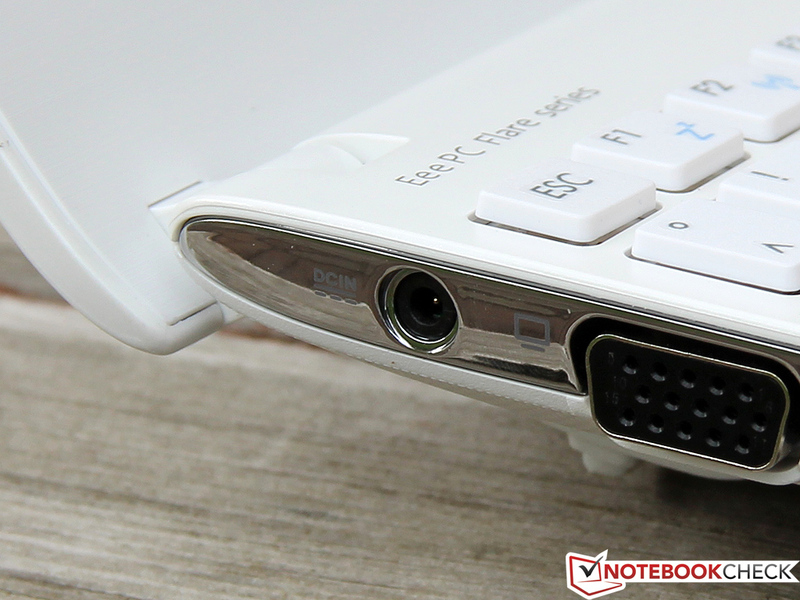 Although the Eee PC has a modern HDMI interface, most users will use the analog VGA port. We can recommend its use as even at a resolution of 1920 x 1200 pixels, the picture is clear and sharp. As mentioned before, the Atom N2800 is part of the Cedar Trail platform launched at the end of 2011 with the (then) new 32 nm technology. Physically, the CPU is identical to the smaller N2600 but is clocked 266 MHz higher: 1.86 GHz. The TDP rose to 6.5 W (N2600: 3.5 W) due to this increase and, although it is still quite low, the CPU can no longer be cooled passively. From a performance perspective, little has changed: the processor still has 2 cores which support SMT (Simultaneous Multi-Threading) and a Turbo mode is still not available. 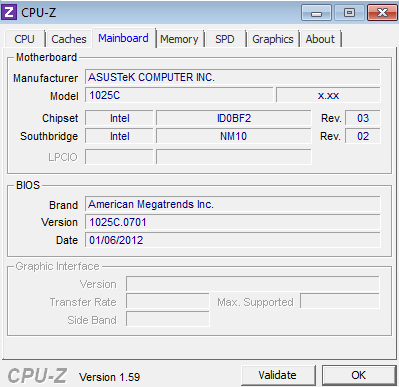 More information about the processor can be found in our CPU databank. The processor contains the Intel GMA 3650 graphics chip. This name refers to the SGX545 GPU from the manufacturer PowerVR/IMG, and is about as powerful as the graphics chips in Smartphones and Tablets. The chip is clocked at 640 MHz - much higher than the GMA 3600 in the Atom N2600 (400 MHz). Still this GPU is low-end and merely supports DirectX 9. 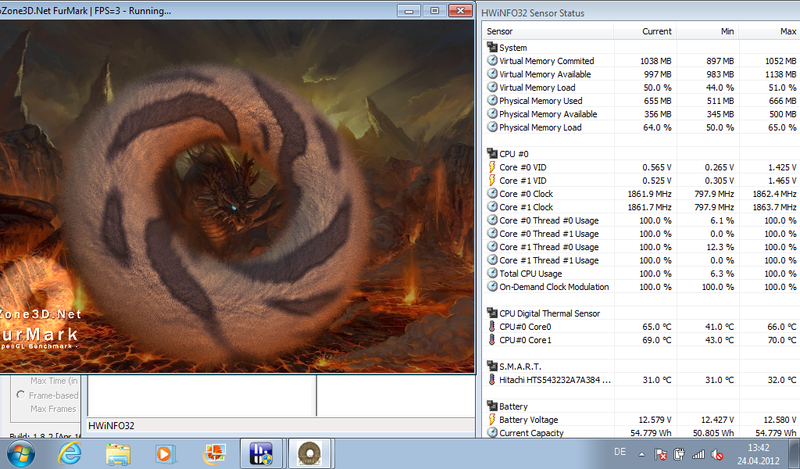 The hardware makes DirectX 10.1 possible, but Intel's latest drivers do not support it. The hardware is rounded off with a 320 GB HDD and 1 GB DDR3 RAM. 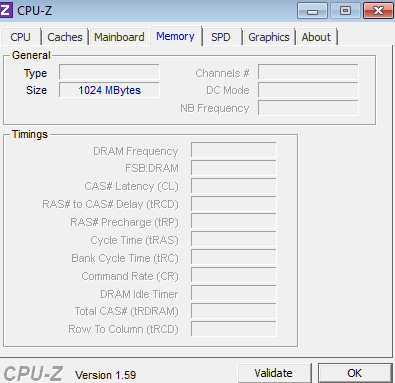 Asus should have installed more RAM as the memory controller supports up to 4 GB modules (N2600: maximum 2 GB). Due to its higher clock speed, the N2800 can beat the slower N2600 by about 12%. In our benchmarks, we noticed a much higher performance gap: the Cinebench R10 (32-bit) recorded a high 648 points and 1,829 points respectively in Single- and Multi-thread tests. 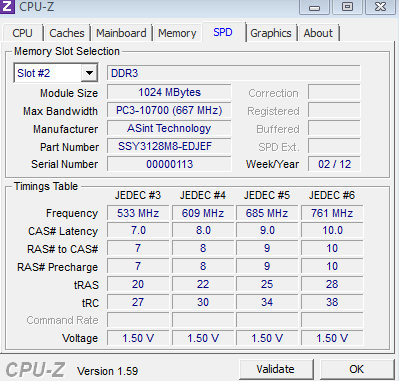 This is about 20% more than the scores of the Aspire One D270. These large performance differences are probably due to measurement errors, as the slower Atom CPU can experience a drop in performance due to even the smallest background process. An increase in Pro-MHz performance, in comparison to the previous generation, is not noticeable. The fiercest competitors of Atom would be AMD's C-series. The strongest processor of this series is the C-60. Although the N2800 falls behind of the C-60 in the Single-thread test by about 20%, in the Multi-thread test it can take the lead by the same amount thanks to the important SMT technology. In comparison to a Sandy Bridge-based ULV CPU, such as the Core i3-2367M, both competitors fall behind by a factor of 2 to 3. The Hitachi 320 GB HDD (HTS543232A7A384) should provide enough storage space of the Netbook. Around 100 GB were reserved for the system partition, (plus 15 GB for Recovery), and the rest of the space is available for the user. The performance of the HDD (5400 rpm, 8 MB cache) is modest. 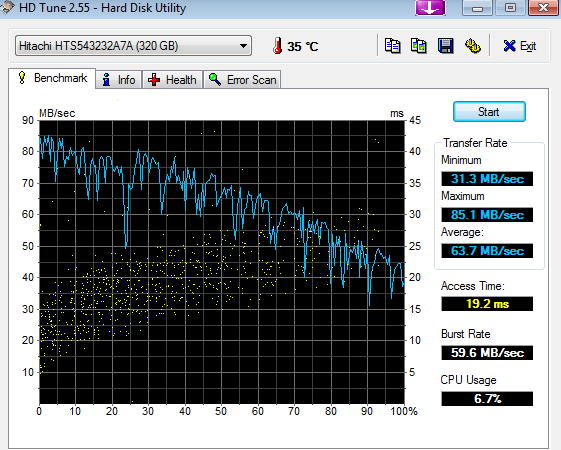 In HD-Tune, the average transfer rate measured 63.7 MB/s and the access time was 19.2 milliseconds. Due to the slow processor, the HDD will rarely ever be a bottleneck and as such, we do not feel that swapping it out for a SSD (see "Maintenance") would be a good idea. Probably due to poor driver support, the PCMark Vantage benchmark could not execute the "TV-and-Movies" test. The resulting total score (1,799 points) is only partial. We had similar difficulties with the Aspire One D270, and we need to wait on Intel to provide better drivers before we can do a proper test. PCMark 7 ran without problems and delivered a score of 739 points. 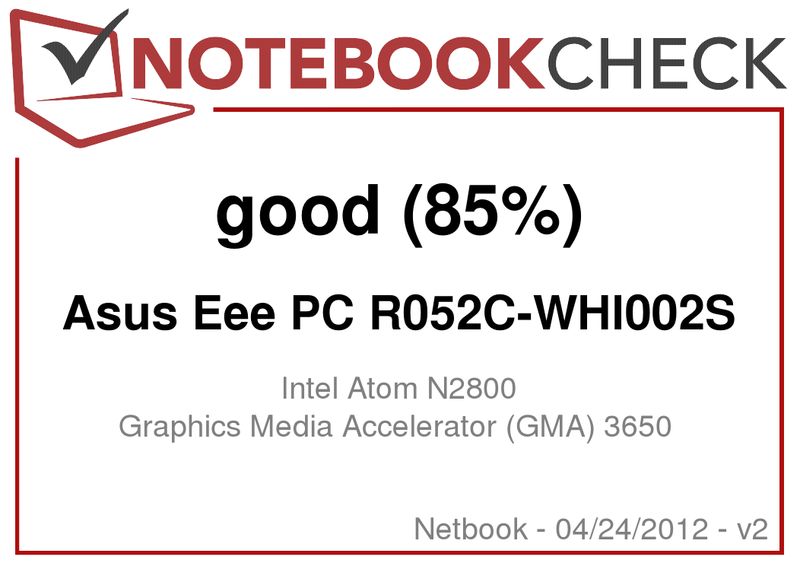 In comparison to other models, like the Eee PC 1015B (AMD C-50), the R052C lies in the mid-field, but even low-end 15-inch office notebooks can achieve twice or three times the score. 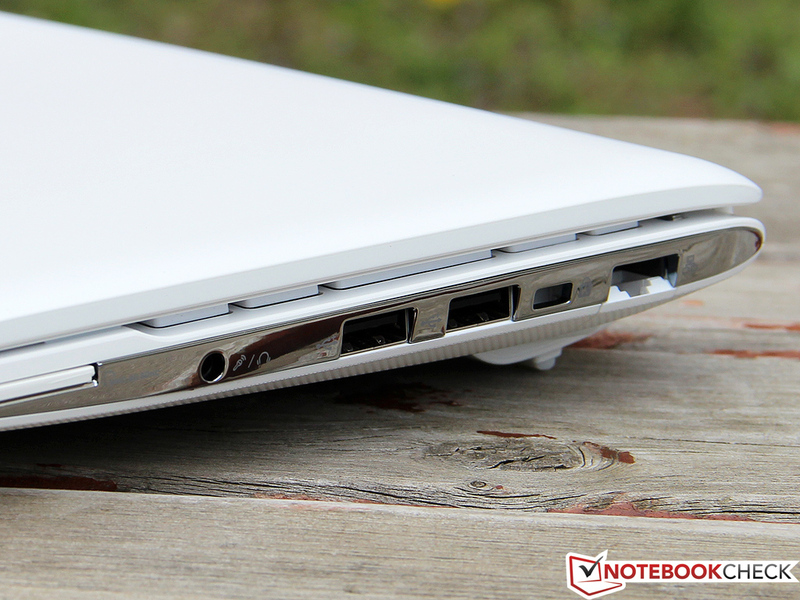 The typically weak Netbook performance is noticeable in everyday use. Starting programs takes a few seconds and even simple tasks do not run fluidly. The limited RAM prevents multi-tasking with multiple windows and browsers and 2 GB of RAM would result in significantly higher performance. 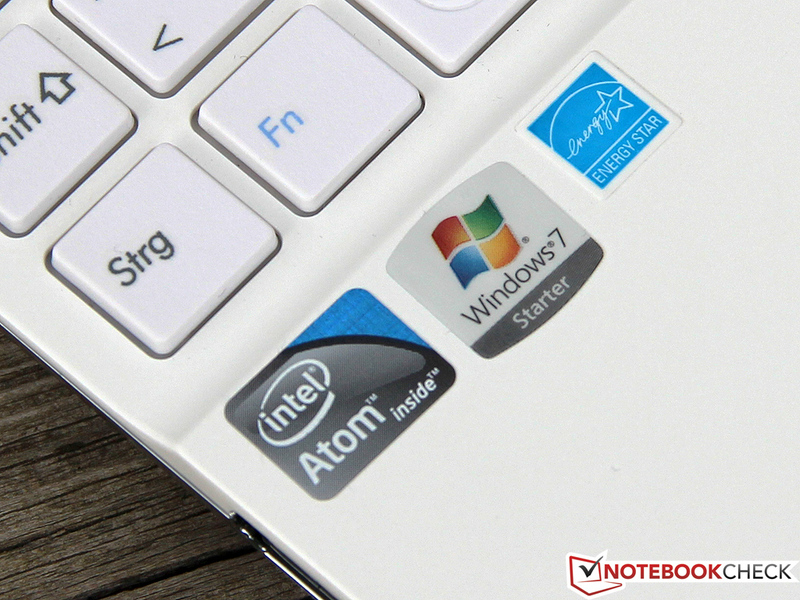 Thanks to the new Intel Atom generation, HD videos, such as on Youtube or Vimeo, play fluidly up to 1080p. So the GMA 3650 is strong enough for simple tasks, like watching videos; what about the graphics performance? If the comparison is restricted to the previous generation, then we can note that the graphics performance has significantly increased. 422 points in 3DMark 06 are more than twice that of the older GMA 3150 (for example, Atom N570). Even in other benchmarks and tests, the increased graphics performance is noticeable. Thanks to a 60% higher GPU clock speed, the GMA 3600 can even beat the new Atom N2600. Sadly, the overall performance is still low; other Netbooks, equipped with AMD's Fusion APU C-50, can beat the Intel test model by a factor of 4. 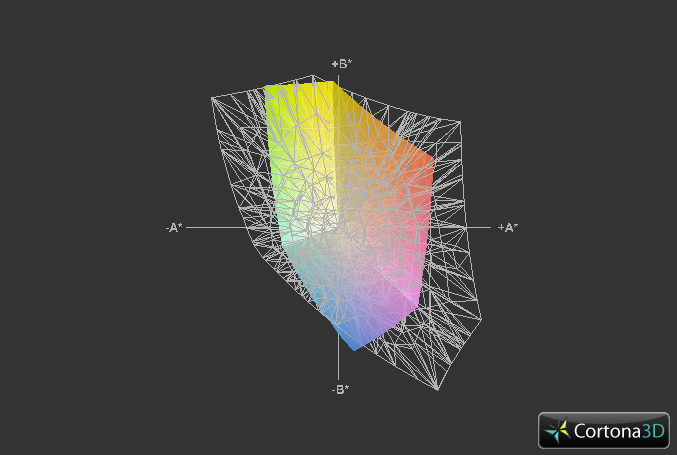 The Atom processor is not suited for 3D application and games. Drive problems and the low performance of the graphics chip makes running one of the latest games without stutters, or even fluidly, impossible. The GMA 3650 cannot even run the old, less-demanding Left 4 Dead fluidly at a resolution of 640x480 pixels and the lowest settings. The game can-not be played - forget about having fun. Furthermore, DiRT 2 and FIFA 12 did not even run as the benchmarks crashed. Although the R052C requires active cooling, the fan remains in the background and while the model is idle, it switches off entirely (30.7 dB(A)). The quiet humming of the HDD is the only sound from the device in this scenario (although when in use, the hard disk can start clattering slightly). While surfing and at high load, which we simulated using 3DMark 06, the noise emissions rose slightly to 31.7 dB(A). The hard disk is the noisiest part of the system, yet, even in quiet surroundings, the Eee PC will not be noticeably loud. 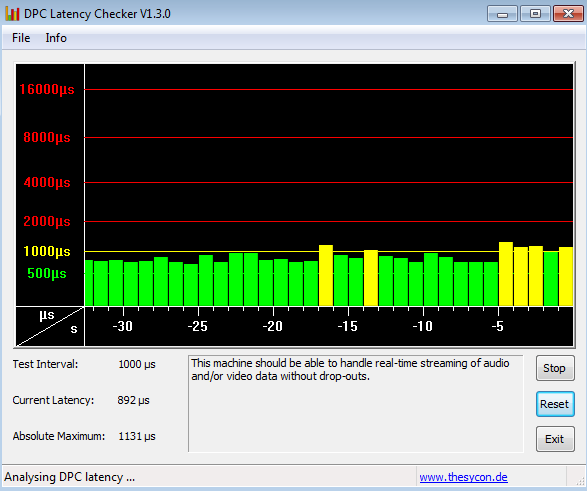 The Netbook really cranks up the volume at full load: 39.4 dB(A). However, in everyday use, such high emissions will be hard to reach. The power-saving hardware ensures that the temperature emissions remain low. While idle, the surface temperature reaches 25 degrees Celsius. The bottom is slightly hotter at 30 degrees Celsius, but the R052C can still be used on the lap. Even at maximum load (Prime95 and FurMark), the surface temperatures rise by a few degrees and only the cooling vent can become uncomfortably hot. Thanks to active cooling, the Atom N2800 always stays cool and, even in extreme situations, stays below 70 degrees Celsius. Throttling or stability issues will not be a problem even in high temperature surroundings. (+) The average temperature for the upper side under maximal load is 25.8 °C / 78 F, compared to the average of 29.8 °C / 86 F for the devices in the class Netbook. (+) The maximum temperature on the upper side is 28.7 °C / 84 F, compared to the average of 33 °C / 91 F, ranging from 21.6 to 53.2 °C for the class Netbook. (+) In idle usage, the average temperature for the upper side is 25.1 °C / 77 F, compared to the device average of 29.8 °C / 86 F.
(+) The average temperature of the palmrest area of similar devices was 29.3 °C / 84.7 F (+3.1 °C / 5.5 F). 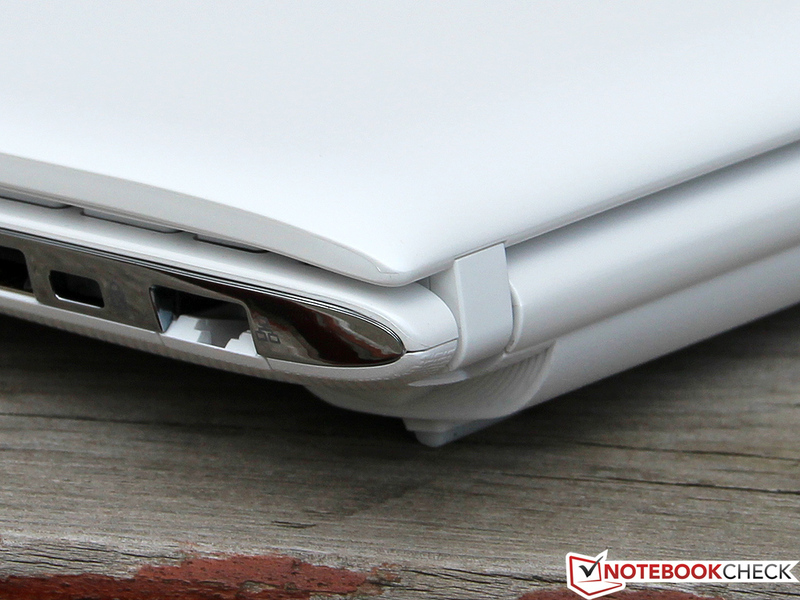 Sadly, the compact Netbook has a weak mono speaker, which is hidden on the right side, near the front. Deep bass is impossible for the tiny speaker, but it still manages to deliver decent sound with good maximum volume and it should suffice for everyday use. The R052C can be connected to an external speaker system to enjoy movies or music. The HDMI interface can transfer digital audio to a Hi-Fi system and the audio jack is available for a more traditional output. The idle power consumption amounts to 5.7-7.8 watts, which is similar to the Aspire One D270. In comparison to last year's Atom platform (see Eee PC 1015PX), the numbers have improved slightly, which could have been caused by other components as well. At load, the power consumption rises to 10.3-14.1 watts. Netbooks using AMD's Ontario APU, such as the Aspire One 522, require 20 watts. However, that is appropriate as they have better graphics performance. The Atom N2600 is the best power-saver as it has a low TDP of 3.5 watts. 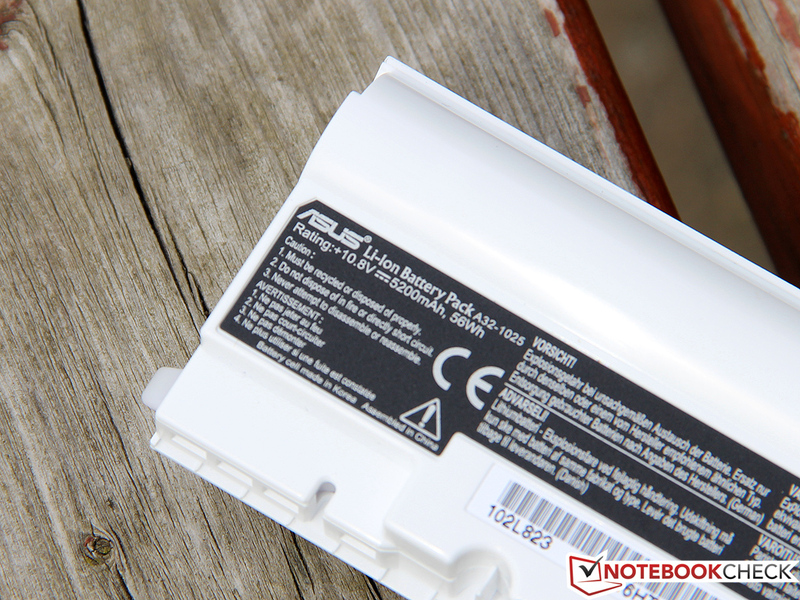 Asus promises 12 hours run time with the large 56 Wh battery. We could not confirm this claim. In the Battery Eater Readers test, the laptop barely lasted 11 hours ("Power Saver" mode, minimum brightness, WLAN off). This is a good score, but it does not say much about the everyday run time. With WLAN on and altered display brightness (Level 9/11, 143 cd/m²), the laptop can last through the classical 8 hour work day. In this test, we loaded websites and HD videos randomly with a 40 second frequency and simulated a realistic Netbook load. 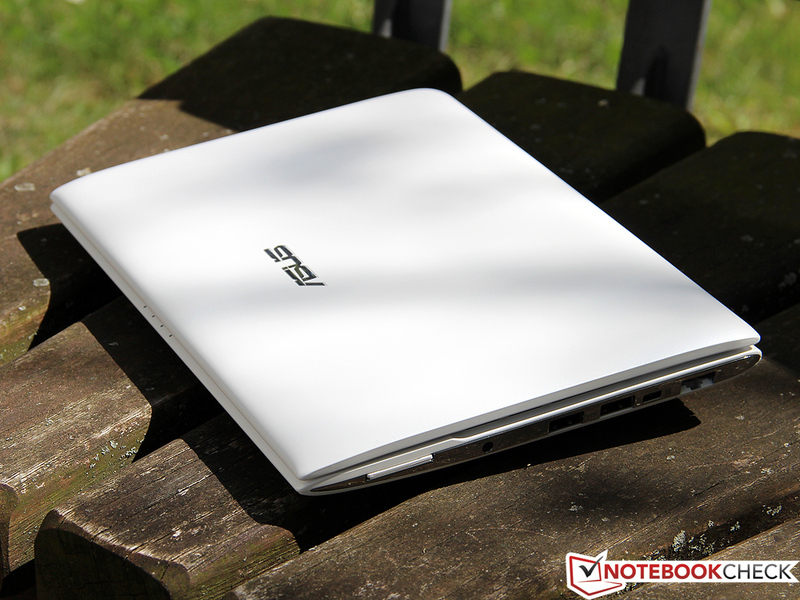 The power-saving hardware and large battery ensure that the laptop runs for a long time even at high usage. The Battery Eater Classic test ("High Performance" mode, maximum brightness, WLAN on) the CPU and GPU are stressed, yet the R052C still runs a good 5 hours on its battery. Now for the con: the laptop requires 5 hours and 46 minutes to recharge fully. 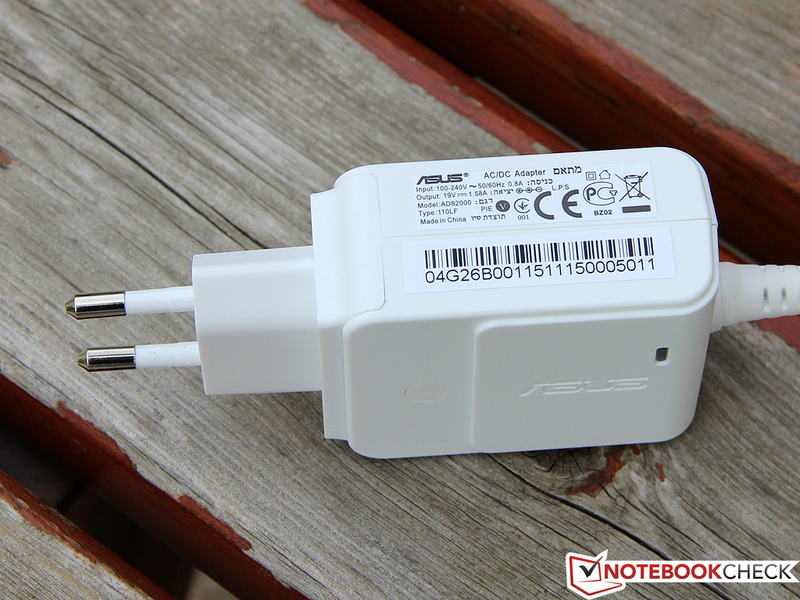 Maybe Asus should have included a stronger power adapter than the 30 W model. Evil tongues are already yapping about the "Flawed Atom" when the topic turns to Intel's Netbook processors. We do not rate them so poorly, as we believe that, although the new Cedar Trail platform is not as powerful as we had hoped, it is still a step forward. 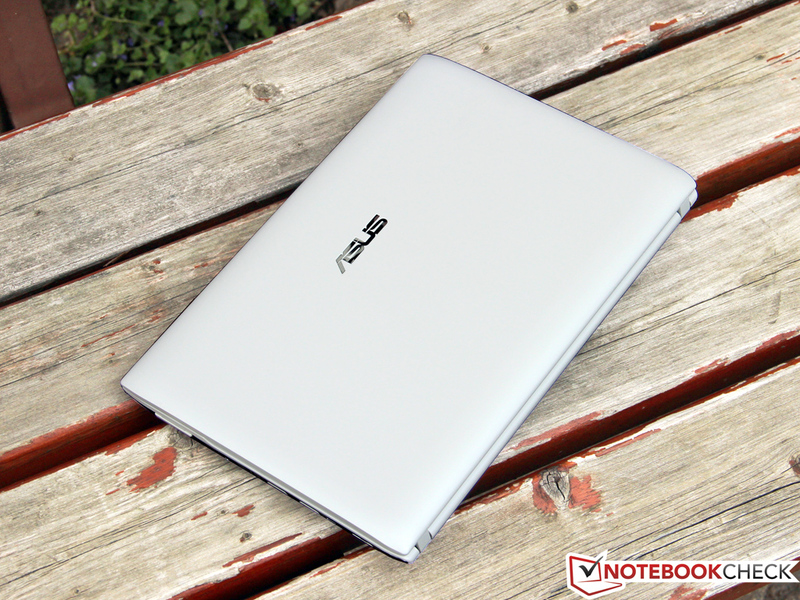 The Asus Eee PC R052C is a solid Netbook without any major strengths or flaws. The workmanship and sturdiness of the simple case made of synthetic material is decent and the test model is quite mobile. We would have liked to see a brighter, higher-resolution display and we can live without a USB 3.0 interface in a device of this price class. Although, in comparison to the predecessors, the performance has increased, it still is quite limited. We are not talking about the poor gaming performance; instead we are referring to the miserable system performance while performing simple tasks. Thankfully, HD videos are played fluidly now and the Netbook is equipped with a HDMI interface. However, even the smallest programs can cause a drop in performance. 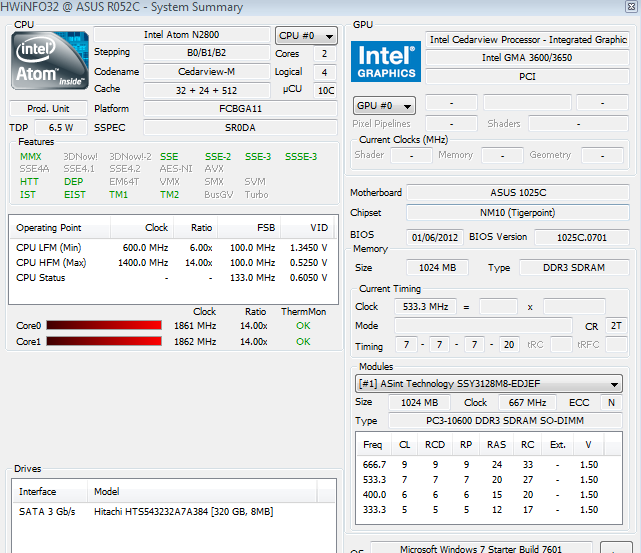 Asus should have equipped the R052C with more RAM. This is the main flaw as any other flaws are acceptable for the Netbook class. In comparison to the competition, we find the AMD-based models to be most attractive as they offer better performance for slightly shorter battery life. The Acer Aspire One 522 (722 in the 11.6 inch version) combines a fast C-60 APU with a 720p screen and can hold up to 4 GB RAM. If the display were matt, we would have recommended this model as the ideal Netbook - as such, each user will have to decide for themself, what they value most in a device. Disappointing: a 0.3 MP webcam. and the touchpad is average. but an entire work day without recharging is possible. takes care of power supply. and it should not cause any problems for the quiet cooling system. has to prove its worth against the entire Netbook world. this 10 inch mobile companion is easy-to-use even outdoors. and the stiff display hinges are also impressive. Unfortunately, the maximum opening angle is limited. It is quite hard to upgrade the R052C. 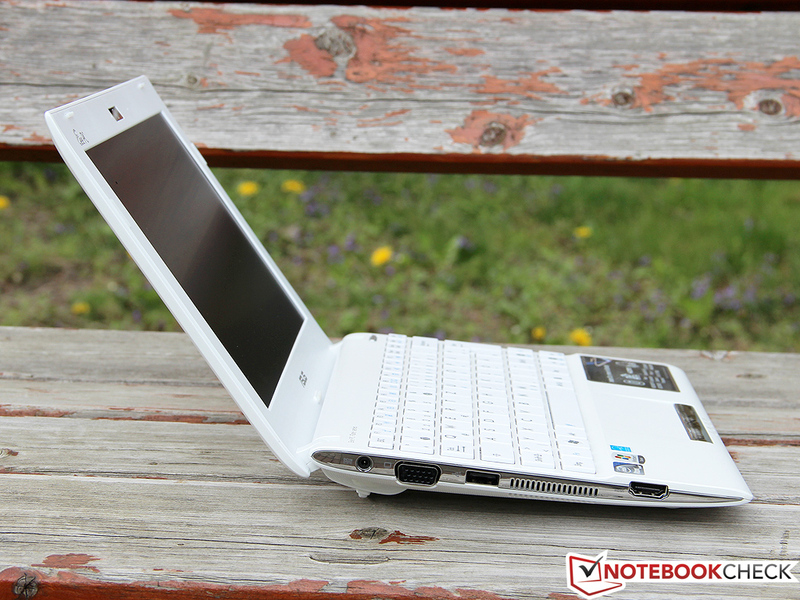 Small, light and very mobile - this is what a Netbook should be. At least 2 GB RAM should be installed in an entry-level laptop. 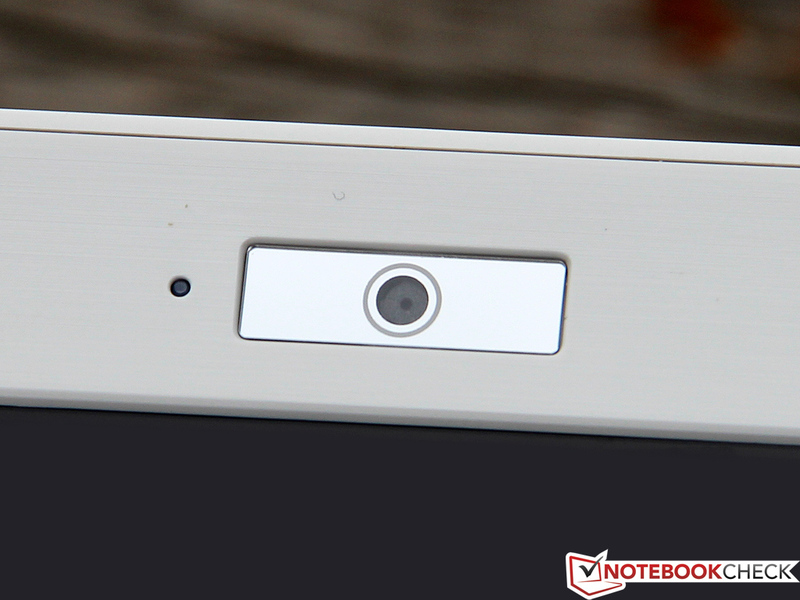 The 1024 x 600 pixels resolution places the R052C below some Smartphone screens. Power-saver thanks to the N2600: Acer Aspire One D270 and Asus Eee PC 1011CX. Fast and high-resolution: Acer Aspire One 522 or the larger Aspire One 722.